By definition, memes are shared virally on social media platforms. For memeable video clips like “Why you always lying” or the clip of Wendy Williams fainting, you might want to make a meme out of a video after watching it on YouTube. In this article, I’ll describe how to make a meme out of a YouTube video using a free, online tool. Once you make your meme, you can share it to Instagram, Facebook, Twitter, or other social media platforms. After you find the YouTube video you want to meme, open the Kapwing meme generator. Click the “Upload” button in the lower left part of the toolbar, then copy and paste the URL from your YouTube video to import the video into the Meme Maker. Now that you have your video on the Kapwing meme generator, you can resize it, add text and shapes, trim the video, change the background color, and position it with other images. Kapwing also has a gallery of meme templates with overlaid text and captions above/below the video. Design your meme and click the “Create” button to finish it. Once your YouTube video meme has been processed, you can download it as an MP4. Share it on social media or message it to your friends! Memes are amazing ways to make people laugh, create community, and connect with an audience. Happy meme-ing! Kapwing’s design tool is one of the internet’s most popular meme generators and works for videos, images, and GIF memes. 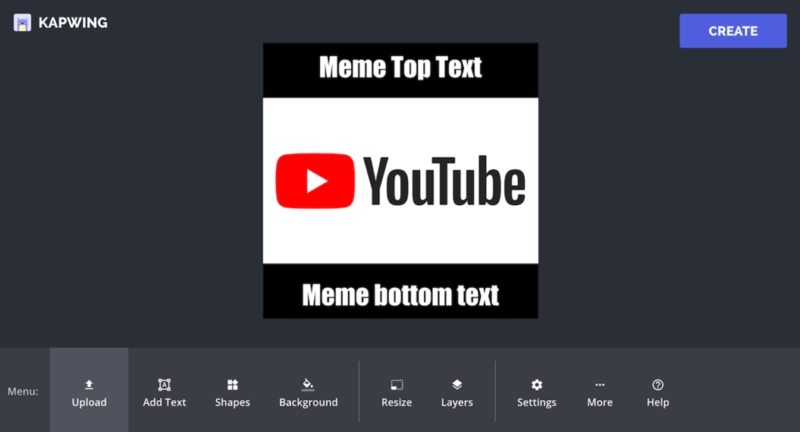 You can resize your canvas to 1:1 for Instagram, 9:16 for Instagram Story memes, 16:9 for YouTube, or 5:4 and 4:5 for other platforms. The tool can also be used for other video design tasks, like making Instagram Stories. The website is free to use, but your output video will have a small Kapwing watermark on it. It supports direct import from YouTube for video files up to 300 MB big and 30 minutes long.